We offer 10 different slides: Models #418 - 428. This presents a lot of options, so here's a few easy things to help you decide which model will fit you best. Simply put, we use glass with 2 different wall thicknesses, and there a few different sizes (such as large/small and short/long) in each of the 2 different wall thicknesses. The tapered interior and length of slide can also be tailored to your specifications. 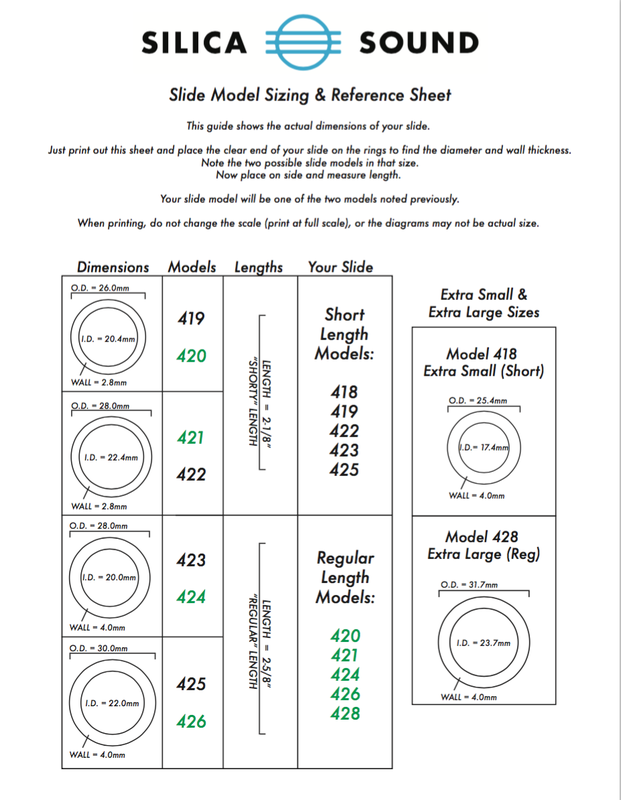 For online orders, please take a few moments to make sure you have properly determined your slide sizing. This will avoid exchanges due to sizing issues, saving everyone $$$. It is best to first determine which model will fit best. We have made a simple, downloadable guide to help you with sizing. 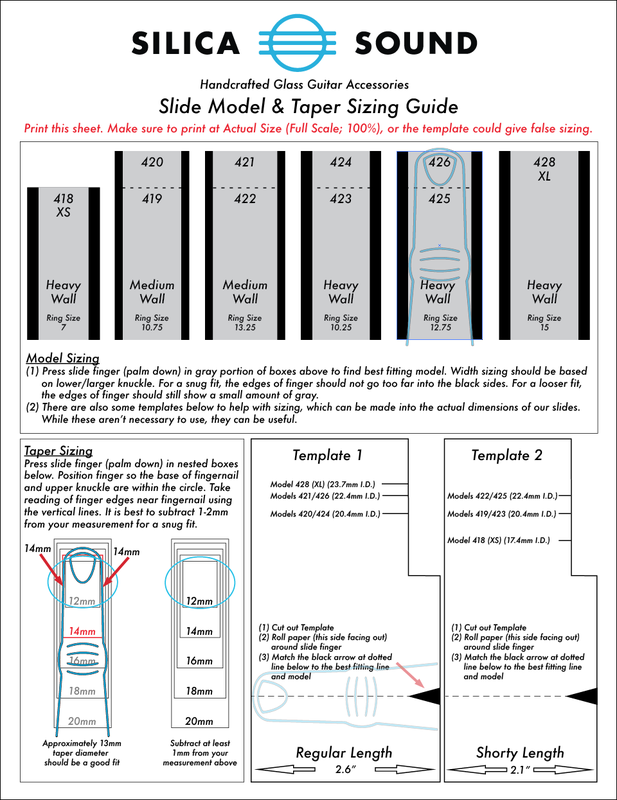 Just click on the Slide Sizing Guide image to get the pdf. Make sure it prints at 100% (actual) scale. Please check print settings and correct if necessary. Measure the width of Template 1 (2.6") to check for accuracy. We can create a custom fit for you by controlling the inner diameter of the colored end of the slide, or by cutting the slide to a custom length. This option is FREE for international orders. Just add it to your order, and we will refund the charge once you place the order. Please take advantage of this so your slide fits well! First, determine which model you want, then measure for taper sizing. 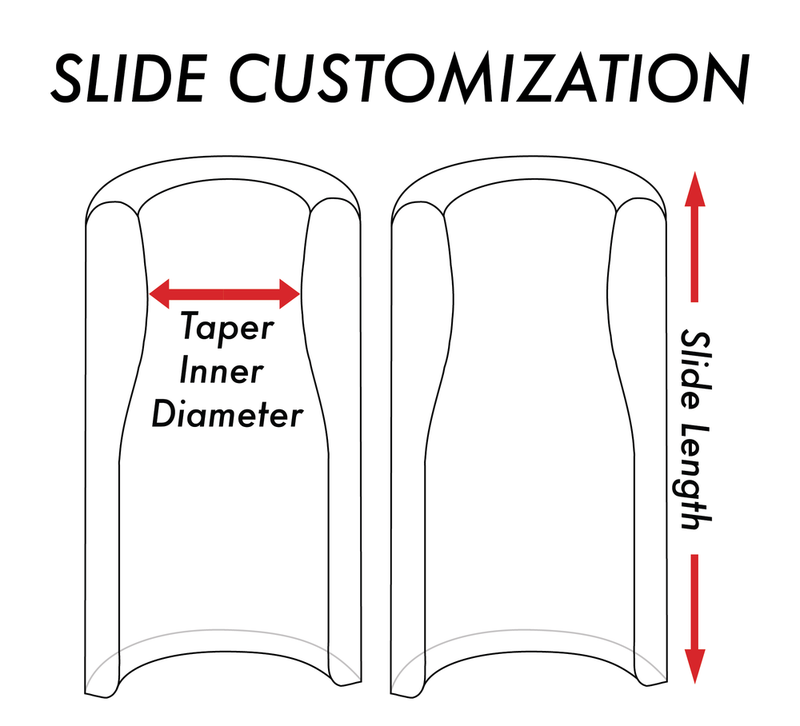 One of the easiest ways to find your Taper Inner Diameter, is to use the Slide Sizing Guide above. (2) divide your measurement by 3.14 (pi) to get your "Taper Inner Diameter"
Or, If you have access to a pair of calipers, measure the diameter of your finger where the taper will rest. Taper Diameters tend to be in the range of approximately 13-17mm. Already have one of our slides, but don't remember what model you have? Here's another handy guide which can be used to figure out what model your existing slide is. Click on the image to download the reference sheet. Then, just print out and follow the directions. Make sure it prints at 100% size so the templates are the correct size. Please check the settings and correct if necessary. Measure the 2-5/8" scale bar to check for accuracy.